The newly renovated Rand Daily Mail House in which Nei’s new apartment is situated was once home to the prolific eponymous newspaper. The daily newspaper was published from 1902 until it was controversially closed in 1985 after adopting an outspoken anti-apartheid stance in the midst of a massive clampdown on activists by the security forces, according to the archived history by Times Media Group, who later digitized the publication. 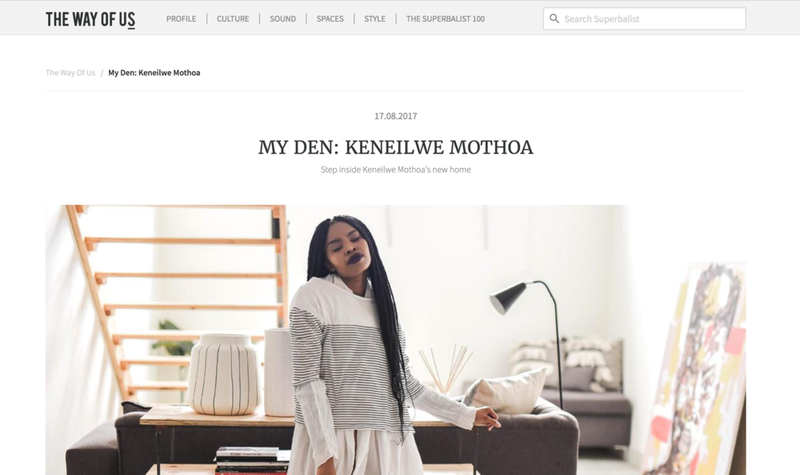 The title, based in the building Keneilwe now lives, was circulated as a daily newspaper and best known for breaking the news of the apartheid state's Muldergate Scandal in 1979. More poignantly, it is reknowned for exposing the truth about the death in custody of anti-apartheid activist Steve Biko, in 1977. Hints of color accent the space, bringing a whimsical element to the otherwise neutrally toned home. A large painting in shades of marigold, salmon and tangerine, leans against the center of the biggest wall, proudly watching over the living space where Nei exclaims she ‘loves to have people over to eat and drink wine.’ The painting, an abstract portrait of the lady herself, was a gift; ‘My boyfriend Lu commissioned one of my really good friends Sash who is a multi talented artist and fashion designer to do this painting for my birthday,’ she smiles and we exchange stories of the surprise birthday dinner party both of us can only vaguely remember. ‘My new place is a work in progress, but I think it’s a great canvas to start a new chapter in my life.’ The phone rings and its Lu on the other line; she smiles.I couldn’t agree more. Here’s to your new life, we can’t wait to see it.